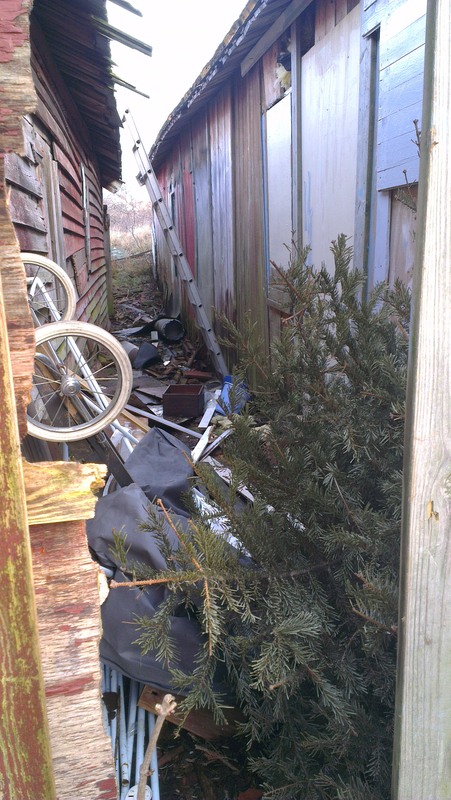 Come outside and find that someone has hidden a huge Christmas tree behind the barn. The last thing I need is kids thinking that I have trees in the barn so I quickly carried it away and dumped it further down the road. 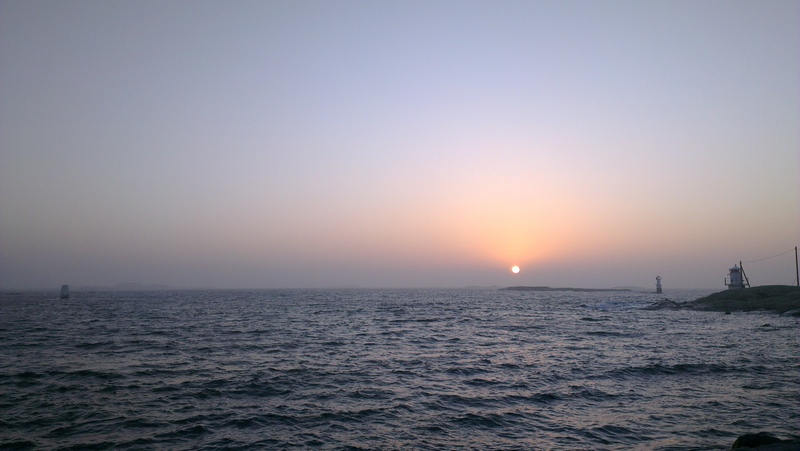 Later in the day it vanished. I really like this tradition(you can read more about it in the post The big hunt is on) but there is a negative side to it as well. Kids(in the age spann of 7-25 year-olds) breaking in to sheds, barns, houses to hide or find trees. You see them all over the island from morning until late evening cycling around in their one-piece padded overalls. If a tree is found there is a lot of pushing, showing and pulling and sometimes fistfights. All in all though hope the tradition will carry on. At least the kids get a lot of fresh air, exercise and excitement. I see green everywhere. Bought paint for the fence and used it all up but it was only enough for half the fence. I can’t decide if it’s too green. 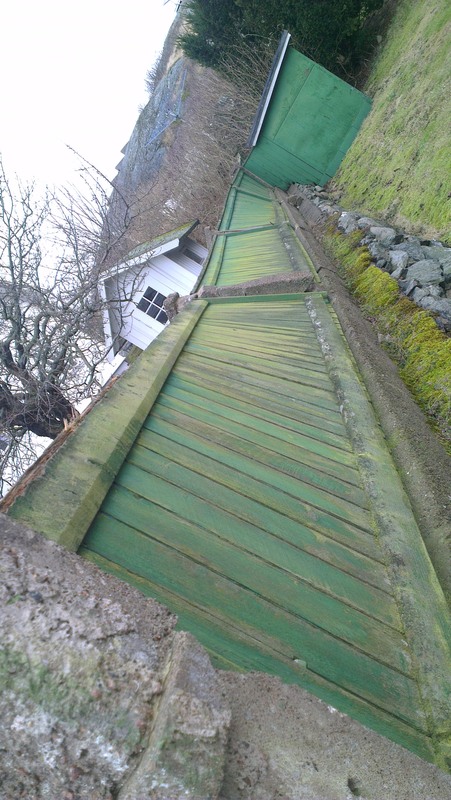 I might buy a larger can of a more mellow green and repaint the whole fence. With my new found confidence in woodwork I decided to build something, while waiting for the paint to dry and to make a decision about the colour. 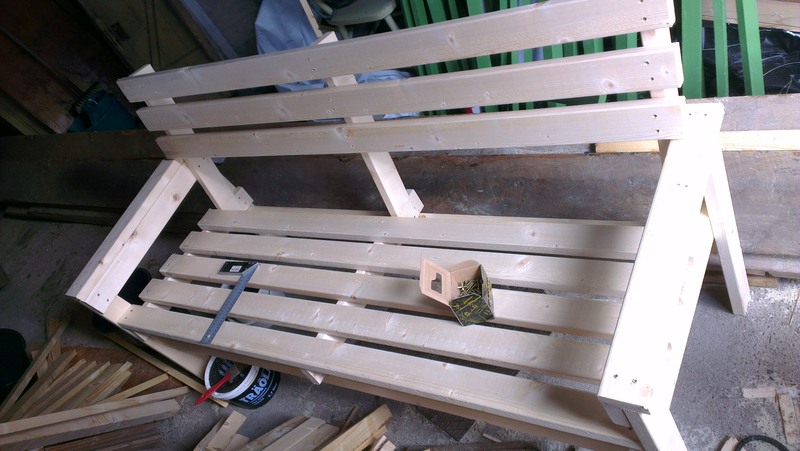 Flickered through my “Builders manual-how to build things indoors and outdoors” and decided on a wooden sofa/bench. Our old one is falling apart so I had been planning on buying a new one come spring. Cycled down the wood shop and got everything I needed. People staring and laughing at me as usual, with my 4.8 meters long boards on my little bike wagon… Cutting the wood and putting it together took about four hours and then Voila! I have a new bench. It was so easy! Now I really got the taste for it, maybe I’ll quit photography and take up carpentry instead. What to build next? Yes! 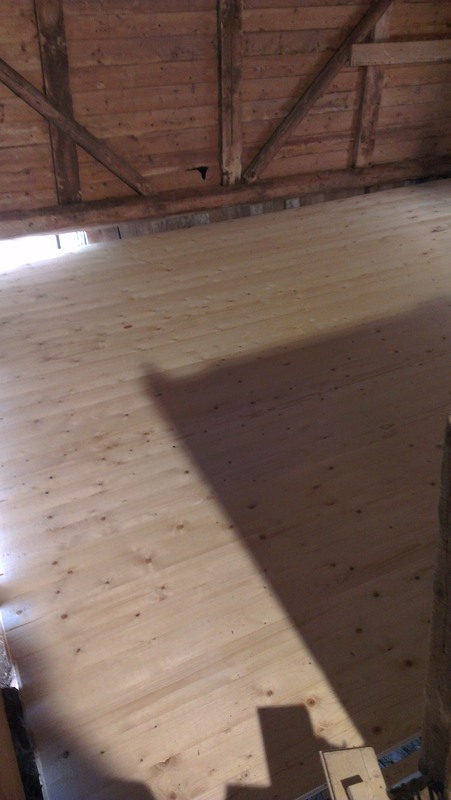 Close to two years later, that’s when I started this blog and the barn adventure, I have a floor finally! 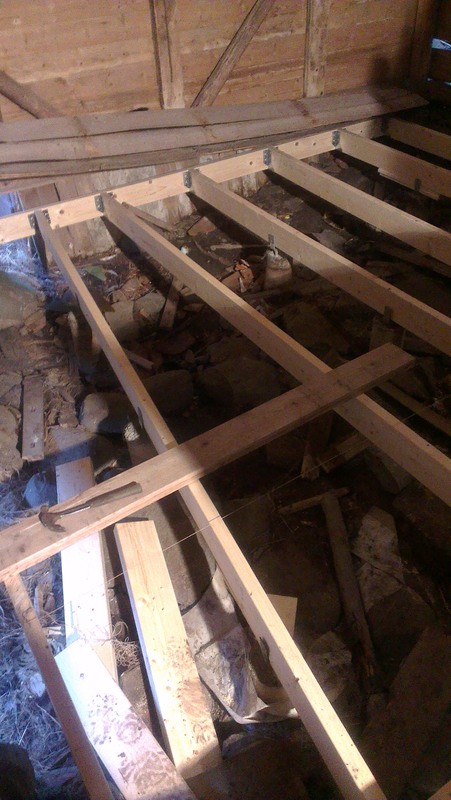 All the floorboards are in place, much more work than I anticipated. No board was straight so I had to push them together as hard as I could while at the same time drill it in. I’ve filled in tiny holes and blemishes with spackel, oiled it and tomorrow I will use soap. I’ve read a lot and people say many different things about what’s the best way to treat a wooden floor. I reckon the oil will be a good start and then when I use soap it will with time build up and make the floor harder and more resistant. Since people will walk on it with their shoes on it’s not staying spotless. Now I have to start planning the opening night! 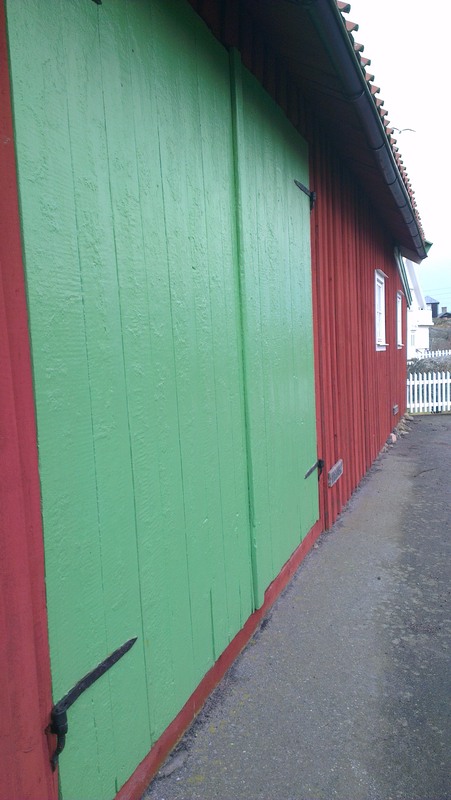 I have also started to paint the fence. The green paint I chose is rather too green for my liking but I am using it anyways. It will mellow a bit being rained on and if I don’t like it I can always re-paint it. I’m planning on painting all the bits before assemblering. There is a lot of littel things still not decided on though. Where to put the gate, use thicker gate-posts or not, gate to look the same as the fence etc etc. I guess I’ll just put it together and then I can always change something later. Reading my builders book with fresh confidence there are so many things I plan to build! 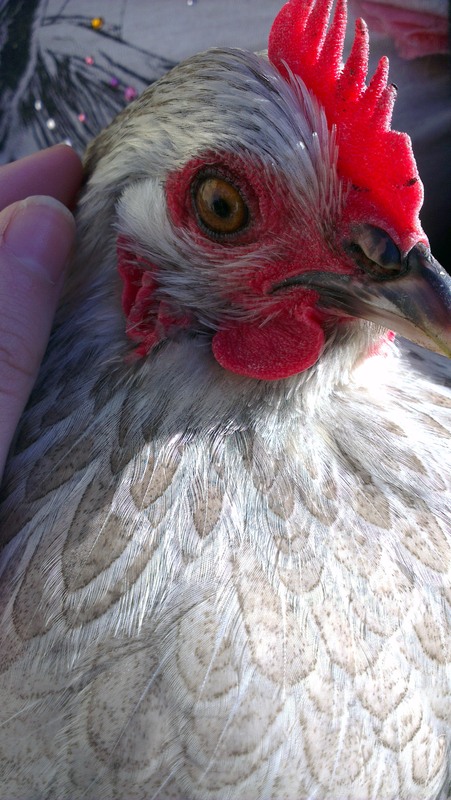 The hens are getting braver and today they loved the sunshine, sunbathing most of the time but everytime they see me they come running up going ”baaaaaeee, caaackkkaaaaa, kluck kluck. Digging up most of my springflowers, that’s the reason I’m hurring the fence. Bottom bit was done but decided to strenghen it at places wider than 60cm. So I added some more thick beams. I’ve brushed the walls and scrubbed the old teams and carried the old wood out that I am re-using. There used to be sloping boards along the sides of the room. I’ve always wondered why they were there, why there wasn’t just straight floor and walls, no one I’ve asked has had a good explanation. 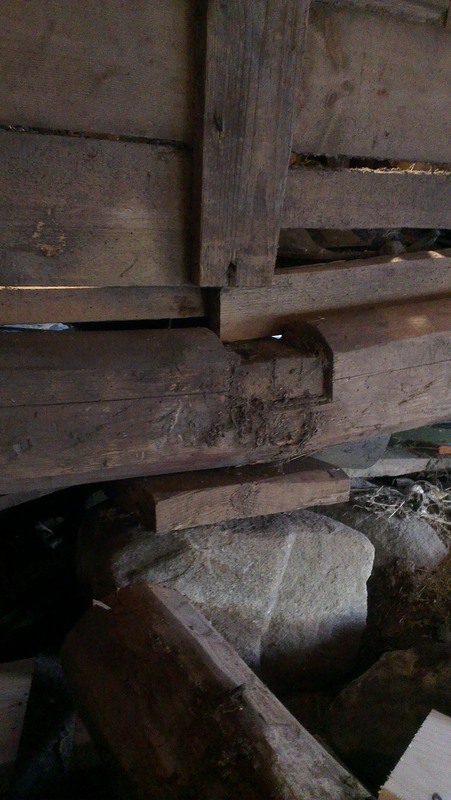 Though now I’m thinking it’s probably been put there for exactly the same reason that I am using it today, to connect the floor to the rest of the barn, The barn is leaning one way and if I had tried to level the floor with the walls the room would have been substantially smaller. Added a net and a metal grate to the back under the floor to stop more soil and rubbish coming in when it rains. Now I’m all ready to add the floor boards! 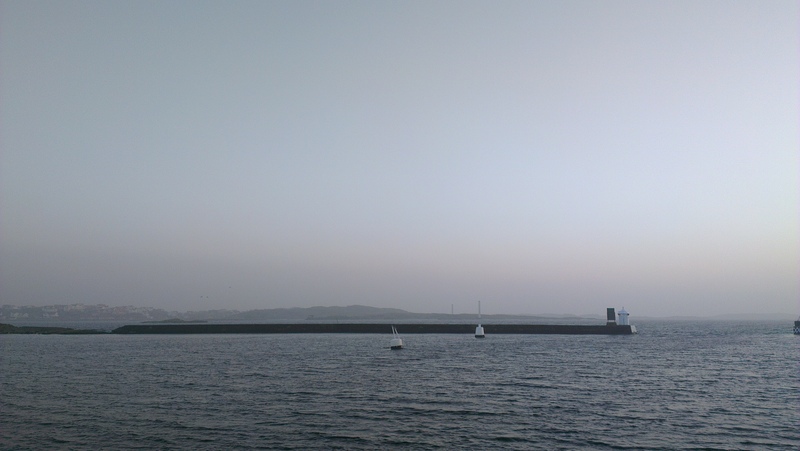 It’s been gray, cold and dreary all day until I came out from the second hand shop down the harbour. The light was absolutely beautiful and I took it as a promising sign for tomorrow. After lunch, a hot bath and a nap and lots of positive thinking, I kept going anyways and finished off fastening the beams. Now all I need to do is lay the floorboards and varnish it(or oil or something?) and put the original sloping boards back to cover up the gap between the wall and floor. There is also a lot of rubbish and more dirt to be removed but first I will take a few days to rest my muscles. almost. Got up early this morning and headed to the wood shop just as the sun was coming up. Because we don’t own a car I used my bike. 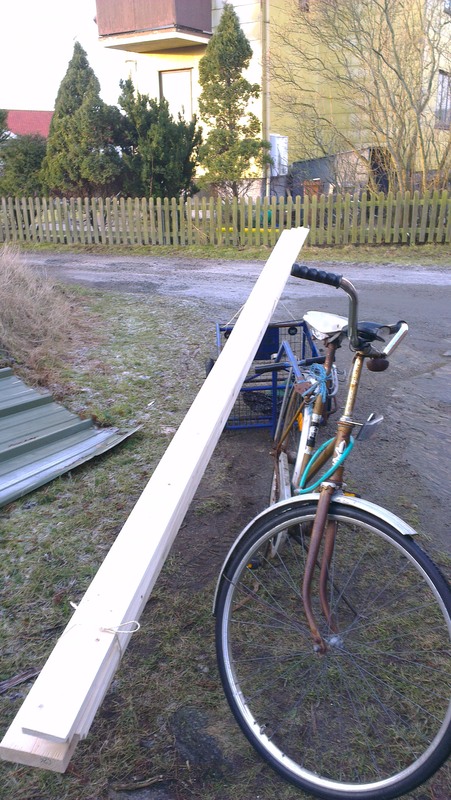 Bought two more beams and some more wood for the chicken-fence and actually managed to cycle back with it, 4.8m long boards. 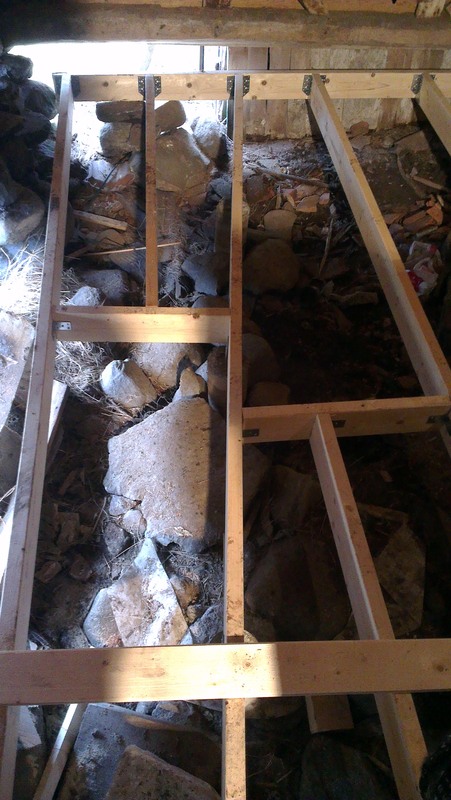 I don’t have to work hard to be known as that crazy old lady in my old days… Got most of the beams screwed tight but one is at an angle, there are these huge rocks that I couldn’t budge when I cemented the foundations for the floor. Great to have a smith next door! 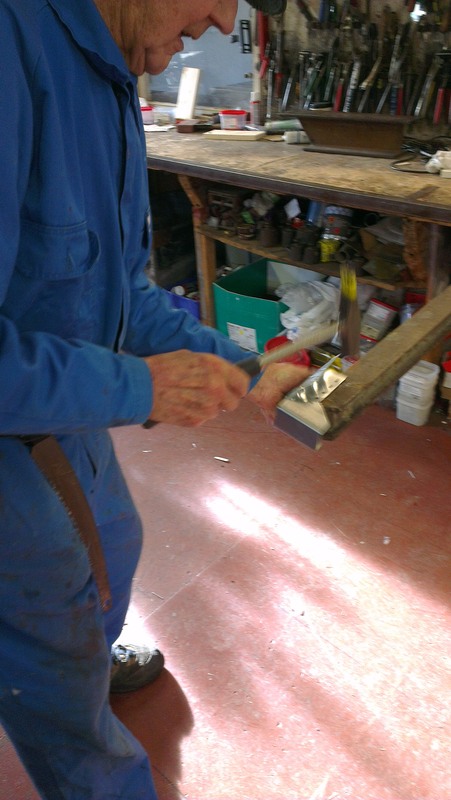 I interrupted my (96 year old) neighbour, while he was up on a ladder pruning his trees, and asked if he could bend the metal thingies that I fasten the beams with. He was very happy to help. The smith’s work shed is now mainly used by his sons but it’s like jumping back in time. 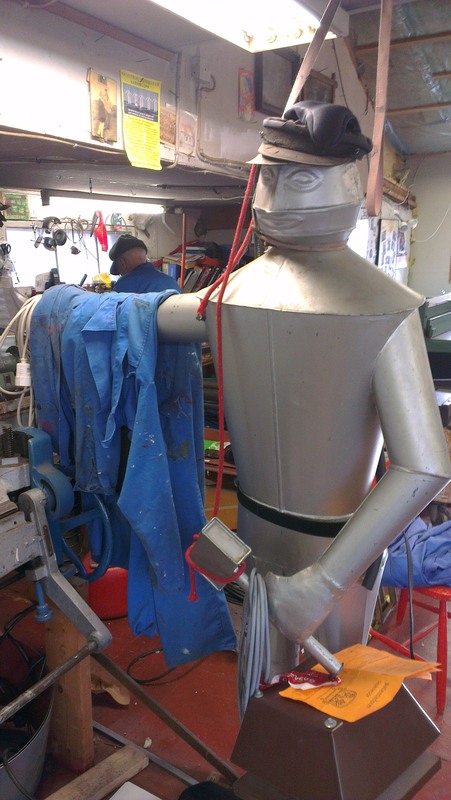 Old tools, old photographs and this fantastic tin-man. So I got all but one beam done. 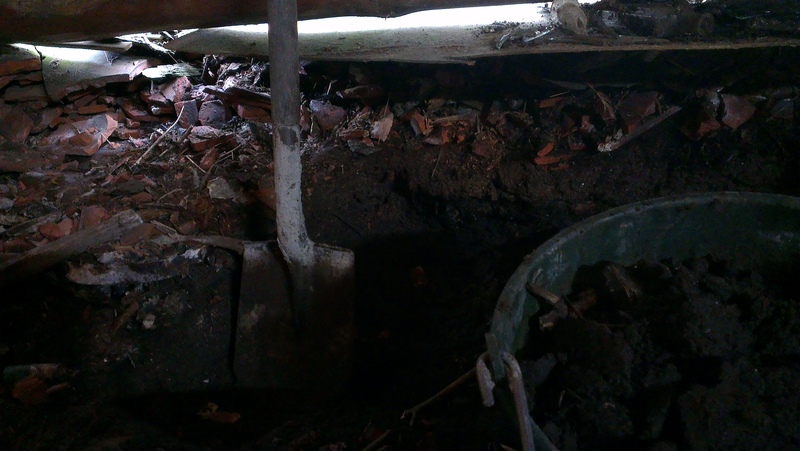 Realised that I had to dig out some more soil and lots and lots of old broken roof tiles. After carrying five big buckets of tiles, 2 of broken glass and a few of dirt I gave in and asked my son to help. So the rest of it I filled the buckets and he carried them out and emptied them. Why am I so stubborn? Should ask for help more often. Of course we finished the job double as fast and saving my already aching back. I am probably cursing it now while writing but over all I am quite surprised that it’s not taking longer and that I am actually doing it. And I’m learning loads on the way. Had to make another trip down the wood shop to buy more tips for the electric screwdriver and they showed me what to look for to get the right ones for my screws. Now I’m no longer intimidated going there because they are so helpful and always make time to show me what’s what. Every morning I wake up early now thinking I could stay in bed because the kids are on holiday from school and I should really take the opportunity to have a lay-in but I am too excited about the barn! Thought I would get most of the bottom frame for the floor done this weekend but turns out I bought the wrong fastening thingies at the wood shop. Chose the biggest ones thinking the bigger the better and sturdier but realised they were for wider boards and of no use for me. Anywho I got lots of other things done. 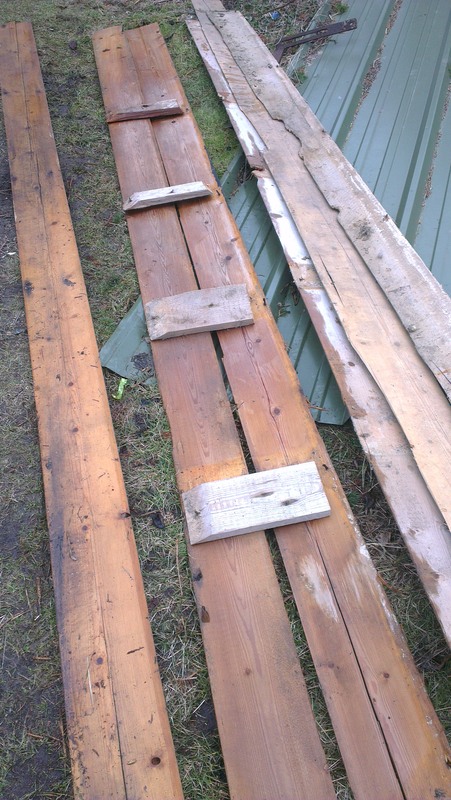 My neighbour lent me a carjack to lift part of the old floor that I’m leaving as it is. I didn’t dare to lift it up all the way to make it completely straight, the barn was creaking and I’m afraid it will do more damaged than good. Now it’s not sloping as much though and I could get the old beam out from underneath that it was resting on. Put a big rock and some wood under instead, big improvement. 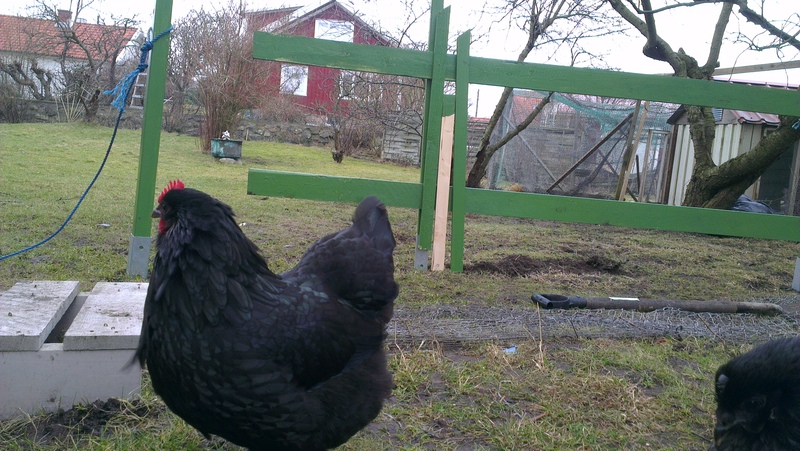 Then I cut all the pieces to the garden fence that I’m building, to stop the chickens from escaping ten times a day. Oiled them and left the end bits in oil over night. My cousin lend me his electric saw so that was a piece of cake. 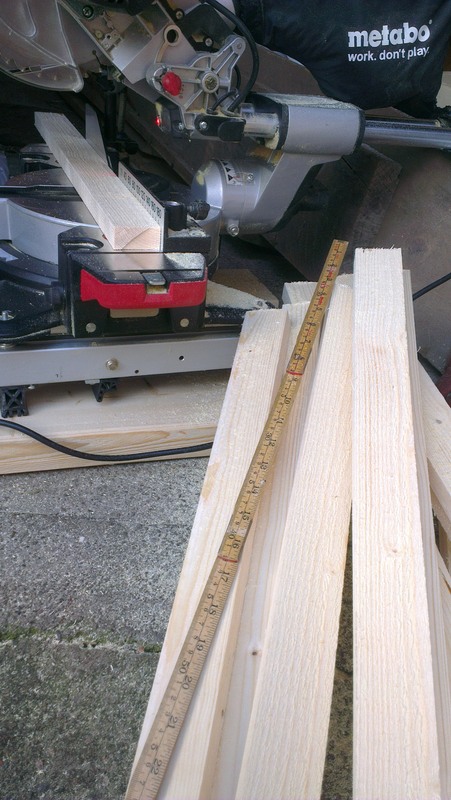 Well it actually took me a while to figure out that the saw was cutting about half a centimeter off of what I had measured. Instead of measuring every time I used the previous piece as a template so they were getting shorter and shorter… Never mind, it’s a great learning process. 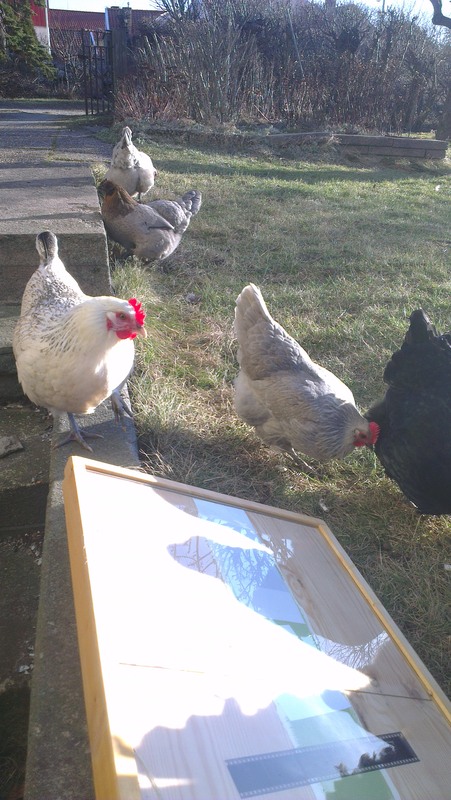 In between I did some Cyanotype printing in the sunshine. The only good thing about long dark Swedish winters is that you appreciate the sun coming back even more! 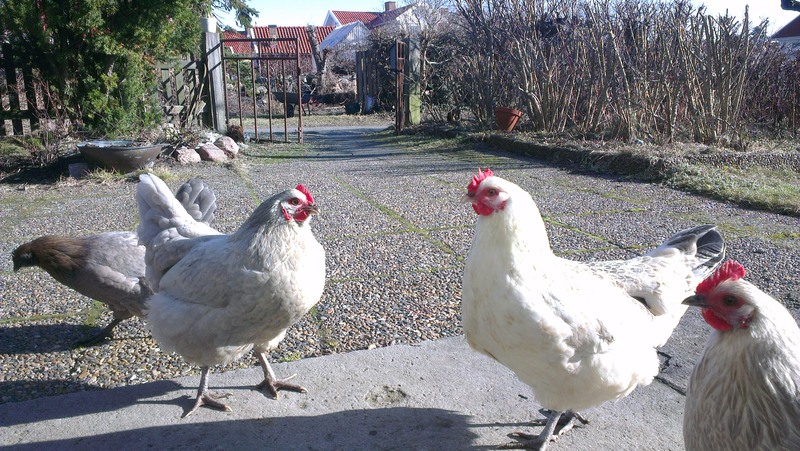 The chickens are also loving the sunshine and kept me company. 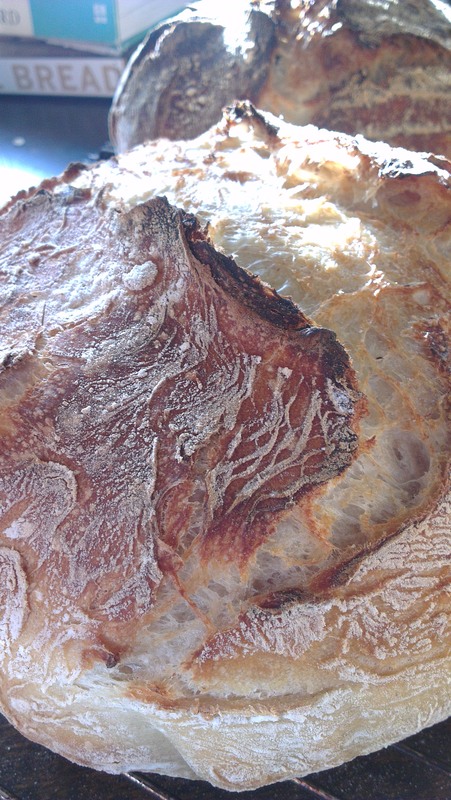 My husband kept busy baking all day so I had freshly baked sourdough bread with strong smelly Danish cheese and Nam prik pao for lunch, yummy!